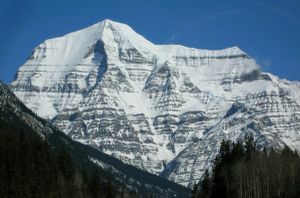 At 3954m (12,972f) Mount Robson is the highest point in the Canadian Rocky Mountains. It also includes Kananaskis Country, to the south-east of Banff National Park, including the town of Canmore. The history of the Canadian Rockies - like that of so much else of Canada - is based in the fur trade and the railroad. The first Europeans to view the Rockies were a ramshackle collection of pioneers who ventured there on behalf of their respective fur trading companies. Most significantly, David Thompson ventured through Howse Pass on behalf of the North West Company in 1804, establishing Kootenay House, near what is now Invermere. In 1871, Sir John A MacDonald convinced British Columbia to join Canada with the promise of a national railway that would connect it to the rest of Canada. The Canadian Pacific Railway was completed on November 7, 1885, and the last spike was driven in Craigellachie, BC. In the following 50 years, Banff, Jasper, Waterton, Yoho and Kootenay National Parks are established, and the area becomes a tourist destination. The gorgeous scenery and unblemished wilderness are but some of the reasons that most of the area is a designated UNESCO World Heritage Site and draws millions of visitors every year. There is wide variability of atmosphere throughout the area. Banff and Lake Louise are likely the most developed towns, while the villages of Field and Elkford attract more through their natural splendour than via any attractions within the communities themselves. The region is probably one of the most scenic in the world between the spectacular mountains, widespread forests and glacier fed lakes. The weather in the summer tends to be hot (30°C) and sunny. In winter it is colder at around -15°C and fantastic for skiing at the area's many resorts. The people living in this area are Anglophone Canadians and therefore speak Canadian English. Canadian National Parks are operated under Federal jurisdiction, and therefore have signs, brochures and (theoretically) all services in both French and English, as well as universally understandable pictograms. Banff is a major international destination, and the tourist industry recognizes the role of international visitors; tourist services are usually available in Japanese and German, and increasingly in languages such as Mandarin and Spanish. In the Canadian Rockies, Banff townsite is the most foreign-language-friendly, followed closely by Lake Louise. Jasper is the next best bet, with travellers advised to check before travelling to smaller or more remote sites such as Radium, Field, Waterton and Kananaskis. The closest international airport are located in Calgary and Edmonton. Some travellers arrive into Vancouver either fly to the regional airport in Cranbrook or drive to the Rockies. There are tour operators that transport passengers between Edmonton and Jasper via Train and Bus. Banff is about a 2 hour drive from Calgary. Jasper is about 3 hours from Edmonton. Either one is about a 10 to 12 hour drive from Vancouver. Note that the highways from Vancouver run through alpine passes, and can be closed or slowed due to avalanches, accidents or other such problems. Closures are most common in winter, which is roughly from October to May. Drivers with little or no winter driving experience are cautioned against long alpine drives in snowy, icy or cold conditions. VIA Rail offers service into the Canadian Rockies via the gateway cities of Edmonton or Calgary. The Rocky Mountaineer rail service is a beautiful way to get to the Rocky Mountains and to see many spectacular sights from the dome car. A great alternative to tour buses and taxis are Bow Valley-based airport shuttles like Rocky Mountain Airport Shuttle or Airporter. Most shuttles offer flexible travel times, door-to-door service, privacy and savings (for 2+ people the private shuttle is often less expensive than a bus or a taxi). There are a number of extremely scenic highways through the Rocky Mountains. This page was last edited on 16 July 2017, at 04:58.